That’s not good of course —but something wonderful did come out of all this. And that is the way so many of you rallied to let me know that you’re still receiving notifications and that you WANT to continue to receive them. More than I can begin to tell you, I appreciated learning how you felt about TMG: that you love it and are learning from it. Since there is not much I can do on my end regarding Feedburner, I’ll just continue to write and put up posts and hope everyone will receive notification — even the folks I’ve not heard from today. I trust you will let me know if there seems to be a problem. Now — about the Garden. I’m so excited about next season. It’s already started for me. Bill got the pvc pipe and rebar to make the hoops over my lettuce for the winter. The rebard will go about 12 inches into the ground and then all you do is fit the bent pvc pipe into it. We have enough plastic to cover it — but that won’t be necessary for another month or more. He’s even working on an easier way to cover the blueberries next year using the rebar and 15 foot lengths of pvc pipe. We’ll see. You’ll recall that the crickets ate my first couple of lettuce plantings, so it’s not as big as I had hoped for this month —- but — I’m eating lettuce. I’m going to plant tomatoes outside my garden next year — just so the garden can have a rest from tomatoes. Thus, I will need to prepare spots for them in the borders by digging each spot deeply and adding organic matter. About 6 holes have been dug for my tomato plants next year. I planted buckwheat in each spot and it’s coming up already. When it’s up about 3 inches I’ll turn it into the soil (a shallow turn) —- wait 5 to 7 days —- and then plant cereal rye and field peas. I think I have just enough time for good growth of the rye before the cold sets in. Not only will all this provide wonderful organic matter and nutrients for the tomatoes — but will act as mulch as well. I’ll take pictures as I go along and will post them in an appropriate future post so you can see exactly what I’m doing and will be doing. Bill was working on the outside of the garden tonight. The soil is black and gorgeous about 3 feet out from the garden. He suggested putting tomatoes outside of that end. I like the idea a lot and since he said he would dig the spots for me —- it’s worth a try. I do have one concern — a squirrel. Bill has kept the numbers down, but this particular squirrel is very low key —- hasn’t bothered anything YET. Squirrels can get inside the garden if they want — but so far they haven’t. I’m thinking that by putting the tomatoes outside the garden right in his path he’ll “discover” them. We’re gonna take the chance anyway. My peppers are gorgeous and loaded with peppers. I’m getting red ones — but not as quickly as I’d like. I’ve had to pick more large green ones than I had planned because they are so heavy I’m afraid the branches will break under the weight even though I have them braced. I’ll have to give a lot of thought to the varieties I want to grow next year. I miss having more of the Carmine Peppers that I grew last year. I miss my Sheepnose. Have to have that back. Then I’ll grow a few favorites from this year. I didn’t have room until late in June for bush beans. By that time — we had drought and they wouldn’t germinate. Finally after planting 3 times — they did. And I have about 6 small succession planting of beans. They are doing beautifully — although I keep pulling off leaves that have rust looking spots on them. Seems to be working. I’m having beans for dinner either every night of every other night. Should go through frost. Hopefully, I’ll have a few to freeze like last year. I have Buckwheat in a few beds that’s ready to be incorporated. The oats and field peas in others bed are up about 7 inches and looking great. Cereal rye in one bed is up about 4 inches. It look skimpier than what I wanted, but still good. Will plant more cover crops in empty beds tomorrow. Harvest is wonderful. I’m getting a least one basket each day — as you see in the picture. 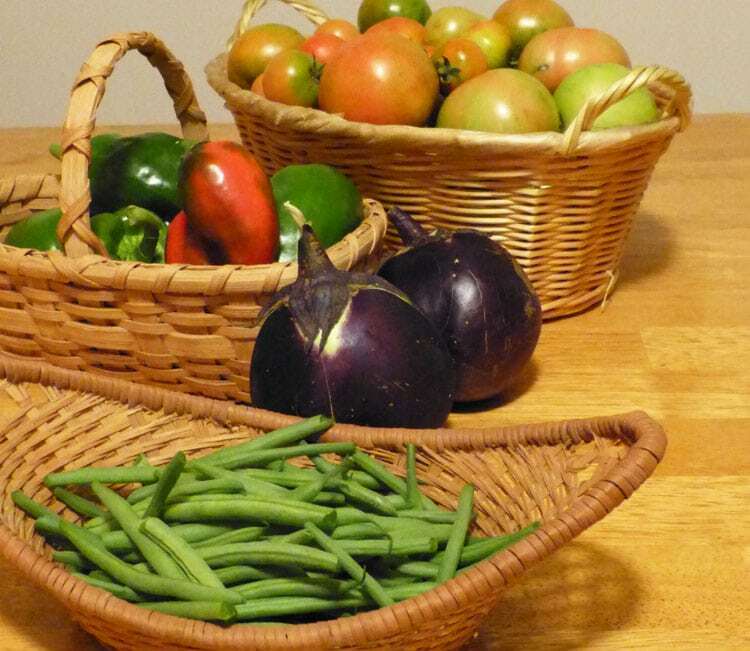 I have 5 baskets in the house and will roast tomatoes and make sauce to freeze some time this week. I’m ready to plant these. Will do a post on them. Great back up and they last and last! A must have for me. Spring Onions coming up in various beds. Nothing like a spring onion! Still setting fruit! We have some time —- so who knows! They’ve been delicious. I’ve cut the top growth twice since August. It’s lush and green now. Also I’ve just put in some new strawberry plants in new beds. Fall is the perfect time. That way — I’ll have more to pick in the Spring. I’m making adjustments to the borders that I should have made years ago. I don’t know why it took me so long to decide. Especially in the front of the house. I’ve got a cover crop of Fava beans (mainly for the biomass they make) in the worse spot. (Took the perennials out.) Need to give some more thought as to what will go in that spot after improving it. Have the spots picked out for 5 grasses and will dig those so I’ll be good to go in the spring when it’s time to transplant them. The secret to not having much to weed is to get the weeds out when your FIRST prepare the soil. Otherwise — you’ll be working yourself to death forever. If you don’t have time to get the weeds out — when do you have time to weed again? If you really want to enjoy your garden even more, make sure you do as much as you can now in preparation for next year. And if you haven’t already — get those weeds out this winter and throw on heavy mulch so you won’t have to have them torture you all next year. There’s always plenty to do without having to weed. I’m really enjoying getting the garden ready for spring. I want to get all these major things done — so I can just walk around, look, and dawdle with making minor changes. Then before you know it, it’ll be January and time to winter sow. Good to know that crickets can eat the greens! I missed your previous comment about that so thanks! I sprayed w/ BT (brassicas and swiss chard) but it didn’t help and I found some small catepillars but didn’t find many so maybe I have crickets also? Do you usually hear them or see them? Very informative article Theresa. I find this such a bitter sweet time of the year. Sad to see things ending but also lots of thinking about what is to come. Oh Theresa, your enthusiasm and energy just carries me along. I love it! I’m excited for your rebar and pvc covers, can’t wait to hear more later. There have been so many great posts recently. I love hearing about what you are doing each month. I’m still getting tomatoes too. That has NEVER happened with me before! Dennis, you would more than likely know if you have crickets. I see them everywhere in my garden. Unless you do too — you probably don’t have a problem with them. If you see a lot of grasshoppers — it could be those that are eating the greens. Grasshoppers and crickets like those tender young lettuce seedlings. I don’t know that this would be the case in my garden or yours — but one reader out in Nevada went out at night with a flashlight and caught rollie-pollies eating her seedling. Also — someone else had earwigs eating theirs. Usually earwigs and rollie-pollies eat decaying matter — but they’ve been caught red handed eating seedlings. Slugs can also eat the seedlings. I’ve had those small caterpillars on my Russian Kale. I just kill them by hand since I don’t want spend time spraying. But I might get some Dipel — which is BT in the dry form and dust my next crop of Kale that is attacked. Of course, it has to be put on again after the rain, but I think it’s a bit easier to do than spraying. Carol – I know what you mean. A lot of folks look at it that way. But here in Virginia — I can be doing something in the garden 98% of the time. Now when the ground freezes and stays frozen —- I don’t like that! And don’t like the snow to stay either. I belong in the garden and digging in the earth and those two things stop me! But — I’ll have to get through it — and like you said — think about what’s to come — and all the good things. Sandra — you are in part responsible for a lot of my enthusiasm this year! Your success with tomatoes this year has delighted me! After I wrote that post about your “tomato situation” — I remember your not wasting a minute and going right out to dig new spots. Your determination really paid off. You and I both had early blight on our tomatoes this year. Corresponding and comparing notes was great encouragement. And as it turns out — we both have had great harvests. We’ve made a good team this year Sandra! PS I’m excited about the rebar and pvc too. I’ll make sure to get pictures and post on the process. I just noticed that I left out info on my green beans — so added that to the post under the part about peppers. Thanks for the very usefull info Theresa! I’ll go back out at night and I’ll put some more beer out in case the slugs are at the plants. I haven’t seen any grasshoppers or crickets and I only found a few small caterpillars that I removed. I have lots of squirrels, rabbits and gophers and the occasional chipmunk but the produce behind the fences doesn’t do much better than the things outside the fences. At least the deer damage is pretty obvious and they usually don’t get inside the fence! Oh Theresa, Thank you so much for inspiring me today, I was feeling frumpy and dreading going back out to the garden and cleaning out beds, old plants, etc. Your article made me remember all the glorious goodies waiting for me in the garden. I have plants loaded with peppers turning red, deep dark green swiss chard, pumpkins getting deeper in color by the day and beautiful butternut squash. Leeks and carrots that I leave in the ground and pick when I need them. The leeks get fairly large, but I just peel away the tougher outer leaves and use the tender inner part. The green beans decided to come back to life and have blossoms and little beans. Have been picking a nice handful daily. Our night time temperature is dropping quickly (41 this morning), but the sun during the day warms things up and the bees come out to play. One word of caution regarding the rebar and plastic. I have used the same practice for the past 3 years and it works great, however I add a layer of row cover between the plastic and some plants so the cold plastic does not come in contact with the plants. The row cover is very light and can set directly on the plants. It worked great on spinach so might also work for your lettuce. I have also used shade cloth and row cover successfully instead of plastic as it allows air to flow through. Thanks again. Thanks Alice. Even though my “hoops” will be tall enough to hold the plastic off the plants — I worry about strong winds blowing it and then if it got on the plants I’d loose things that touch the plastic in cold wet weather as you mentioned. I’d like to find a way I can roll up the row cover with the plastic (on the side bar) so it won’t touch the plants either. I’ve had row covers on plants in the winter that touched them and they don’t do as well as when it doesn’t touch them. Alice, your garden sounds WONDERFUL! Wish I could visit. Well, I looked last night w/ a flashlight to see if I could find any nocturnal pests but no luck! I could sure hear the crickets but I’ve not seen any so I’ll have to be more vigilant. I was glad to run across John Kohlers “YOU tube” video on dealing w/ pests. He took viewers on a tour of a Farmer Supply store and showed the NEEM product that is organic that he uses and he recommended a “hardware cloth” fencing over chicken wire so I’ll get more info on it. You must not have deer if you are going to put yout tomatoe plants outside your fenced area or are you going to fence each one? Fortunately, Dennis, I’ve never been bothered by deer. Hopefully, that will continue. Right now I’m more concerned about the squirrels. I won’t fence the tomatoes but will stake or cage them of course. If you get a chance send me the link to the video you watched. I’d like to hear exactly what he said. Yes, I may declare war on the squirrels again also but I found it to be a losing battle last time since the hickory nut trees, oak, & black walnut all draw new ones right back in. I watched both videos. The old time remedies that the guy CupRock guy addressed were very good and easy. I thought he got a little carried away with the portions of liquid soap and peppermint, but I thought it gave good information. I also watched the John’s Favorite Products video. That too was interesting. There is always something to buy, but basically if you keep improving your soil you won’t need all that. Even with bugs — it’s all a balance. Most are easier to kill by hand than spray. It’s all in what you want to do. I like to keep everything simple, otherwise I couldn’t have as much as I have. Thanks for posting these, Dennis. Yes, John is very big on soil and adds compost every year, even rock dust for minerals which I am still checking on. He doesn’t hold back on spending on soil with all his raised beds. Roger the hand control and I just picked off one of the yellow and black 1/4″ oval guys who looked the same as the ones damaging my brussel sprouts, broccoli, etc. Another gal on the web says soapy water alone didn’t work for her so I’ll try adding the coffee first and then the peppermint I guess since the soapy water alone hasn’t worked for me either. I’m trying to improve my soil since that’s a weak point for me but it looks like I have a new source of compost so if it doesn’t have too much of that black walnut chemical from all the black walnut trees around here, maybe I’ll do better next year! Dennis, I guess you know already — but I just wanted to mention that soapy water is not instant kill. And not always successful. Usually, it’s a knock-down only for adults. It’s more effective on the young since their bodies are more penetrable than those of the adults. The soap in the water is more effective in dehydrating the young. No I didn’t know that. Thanks! I just crushed about 10 of them, I think they were mostly adults, all on one little kale plant. Then I sprayed w/ soap and coffee so I hope my half decaf and half reg coffee has enough caffeine to slow them. At least I think he said caffeine was the main toxin. I’ll recheck. The swiss chard is doing a bit better for me than the kale but they (the deer helped) wiped out my collard greens. I’ll never leave them so unprotected again. Yes – he did say to caffeinated coffee. Roger that! I’ve got the healthiest bugs, deer, rabbits, gophers, squirells in the county since they got more of my greens, broccoli and brussel sprouts than I did! Now I have to figure out if I should use this new source of compost which is about 2 wheelbarrows worth but is contaminated w/ about 20 sprays of Brush B gone (Triclopyr trimethyamine salt). I guess to be safe I should spread it very thin so anything left over by spring will be miniscule. Thanks so much for that great link Theresa! Very informative. What I didn’t tell you is that my Triclopyr is about 10 yrs. old already when I sprayed it on a bunch of honeysuckle the day before the township machine came through and cut 3/4 of them back 3 ft. from the street so they won’t infringe. It doesn’t seem to be even having an effect on the three honeysuckles that didn’t get mulched but I’ll definately be keeping it away from my edibles and I’ll think lots before ever buying it again! Wow! I just noticed what appears to be about a 50 fold difference in strength between the commercial stuff (about 50% Triclopyr) and the stuff we can buy off the shelf (mine is .70%). No wonder lots of toxins are in the environment/food with that kind of commercial strength.